There was a way, and my friend John Walker called it “gleaning”— a biblical practice of leaving some of your crops in the field for the poor. While I agreed with John, I didn’t know how to get that excess produce left behind in fields to those in need. I met John, a Unitarian from the community, when he came to volunteer at the garden at Beaumont Presbyterian Church in Lexington. John wouldn’t give up on the gleaning conversation that we first had in November 2009. He kept it up and, in March 2010, Jennifer Erena, another community garden volunteer, overheard our conservation. She was eager to help. And so, that month, the three of us — John, a Unitarian; Jennifer, a Southern Baptist; and I, a Presbyterian — began GleanKY, a nonprofit in Lexington, Kentucky. Originally, we called our startup Faith Feeds, but soon went with the biblical word “glean” because that was what we were doing. We were picking up the excess, not only from farms but also from grocery stores whose workers would toss fruit and vegetables into the garbage. In our first year, we gleaned from June through November. In those first six months, we had 40 volunteers who collected 37,561 pounds of food from seven sources. The food was then taken to 14 recipient sites, such as churches and homeless shelters, to be shared with those who were hungry. 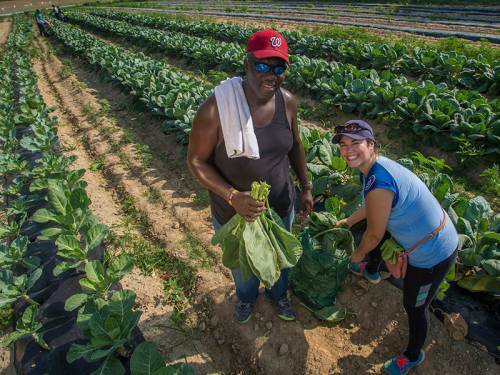 In 2015, GleanKY had 400 volunteers collecting 215,000 pounds of produce from 38 sources, and that food was redistributed to 60 recipient agencies in four Kentucky counties. Today, GleanKY has collected over 1.5 million pounds of produce and delivered it to over 100 agencies, churches and other organizations that feed the hungry and support others who are food-insecure. I am still in awe of what God has done through John, Jennifer and me. Years ago, I was baptized and attended Sunday school, worship, vacation Bible school, youth group and confirmation class. Like most children, however, when I went to college, I liberated myself from church. After being away about 10 years, I found my way back via a series of spiritual retreats. At one retreat, the theme song was “Here I Am, Lord.” The chorus goes: Here I am, Lord. Is it I, Lord? I have heard you calling in the night. I will go, Lord, if you lead me. I will hold your people in my heart. In 1997, I found my way to Beaumont Presbyterian Church. I became active doing everything from teaching Sunday school, to serving on session, to leading worship and delivering a few sermons. When Beaumont decided to start a community garden, I said I’d coordinate the start of the garden. It was the garden where I met John and Jennifer. On Jan. 18, 2010, I wrote in my journal, “It is time to go forward to serve you in a more comprehensive way. Maybe that way involves creating a network of churches …” Two months later, a Unitarian, a Baptist and this Presbyterian started GleanKY. GleanKY’s goal is to be in 17 central Kentucky counties by 2020. My goal, though, is to one day be in all 120 Kentucky counties. John was right. Feeding others with the excess we have can be done — with the love of many helping hands. Gracious God, bless those who work to proclaim and demonstrate your peace and love as well as those who inspire others to do the same. Amen.